Imagine a future where there's no distinction between code and data. Where computers are operated by programming languages that work like human language, where knowledge and data are built in, where everything can be computed symbolically like the X and Y of school algebra problems. Where everything obvious is automated; the not-so-obvious revealed and made ready to explore. A future where billions of interconnected devices and ubiquitous networks can be readily harnessed by injecting computation. That's the future Stephen Wolfram has pursued for over 25 years: Mathematica, the computable knowledge of Wolfram|Alpha, the dynamic interactivity of Computable Document Format, and soon, the universally accessible and computable model of the world made possible by the Wolfram Language and Wolfram Engine. Stephen will discuss the profound implications of this new future on product development, industry, and research, and demonstrate new technology that will soon be part of our present. Stephen Wolfram has been responsible for three revolutionary developments: the Mathematica computation system, A New Kind of Science, and the Wolfram|Alpha computational knowledge engine. Wolfram was educated at Eton, Oxford and Caltech, receiving his Ph D in theoretical physics at the age of 20. Wolfram's work on basic science led him to a series of fundamental discoveries about the computational universe of possible programs. Summarized in his best-selling 2002 book A New Kind of Science, these discoveries have not only launched major new directions in basic research, but have also led to breakthroughs in scientific modeling in physical, biological and social domains---as well as defining a broad new basis for technology discovery. Launched in 1988, Mathematica has revolutionized the way technical computation is done, and has been responsible for countless advances over the past two decades. Starting from a set of fundamental principles devised by Wolfram, Mathematica has continually grown, integrating more and more algorithmic domains, and spawning such technologies as the Computable Document Format (CDF). Building on Mathematica and A New Kind of Science, Wolfram in 2009 launched Wolfram|Alpha---an ambitious, long-term project to make as much of the world's knowledge as possible computable, and accessible to everyone. Used every day on the web and through apps by millions of people around the world, Wolfram|Alpha defines a fundamentally new kind of computing platform that is turning science-fiction computer intelligence into reality. In addition to his scientific and technical achievements, Wolfram has been the CEO of Wolfram Research since its founding in 1987. 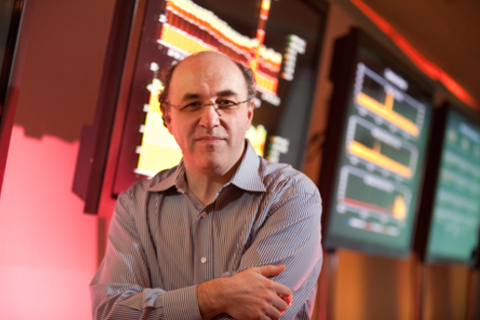 Under Wolfram's leadership, Wolfram Research has become one of the world's most respected software companies, as well as a powerhouse of technical and intellectual innovation, and a major contributor to education and research around the world.